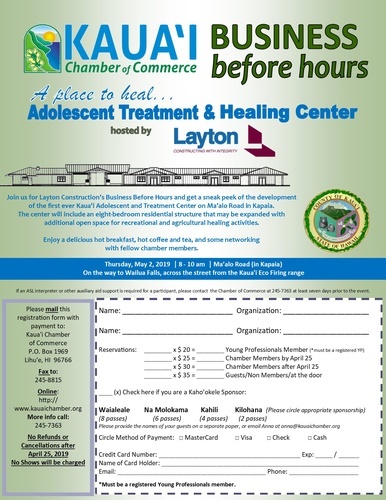 Join us for Layton Construction’s Business Before Hours and get a sneak peek of the development of the first ever Kaua'i Adolescent and Treatment Center on Ma’alo Road in Kapaia. The center will include an eight-bedroom residential structure that may be expanded with additional open space for recreational and agricultural healing activities. Enjoy a delicious hot breakfast, hot coffee and tea, and some networking with fellow chamber members.